This is a wonderful day trip with several beautiful waterfalls and 2 hikes on different style trails. 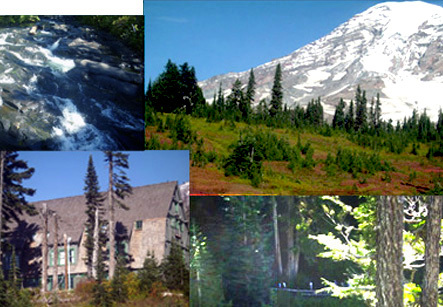 See the mountain up close and enjoy the great Pacific Northwest. You'll see Narada Falls, Christine Falls, many Northwest flowers and probably you'll see some wildlife, too! Once the snow melts, mid June, we travel all the way around the mountain to see all facets of the Mountain. Spring and late October, we may only travel one way and back due to snow, but we've added more trails to make up for it. Any time is a good time to go to Paradise, however we prefer not to go when there is too much snow and chains are required. If we have an unusual snow in late spring or late October and we must cancel, we will fully refund your purchase. Lunch and bottled water included.